The Lipstick Plant (Aeschynanthus lobbianus) is a dramatic flowering plant with its bright red tubular flowers and waxy green leaves on trailing stems up to two feet long. The drama begins with the look of the bright red buds emerging from the tubes that resemble lipstick cases. The plant is a trailing epiphyte which means it grows on another, using it for physical support but receives no nutrients from it . However, this plant gets its nourishment from fallen leaves, dust particles and decaying organisms. It is not a parasite and neither causes harm nor benefit to the plant. It is found growing in trees in moist, tropical areas of Southeast Asia; therefore, it requires higher humidity. One way to know if the humidity levels are low is a sign of brown and dried out or flowers that turn black. Decorative Tip: Showcase this plant in a hanging basket indoors or on a patio. 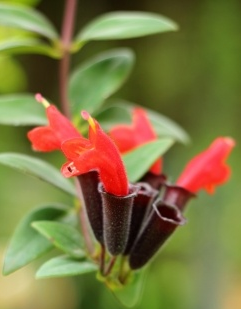 The lipstick plant with its trailing stems and bright red flowers will add a splash of color that will pop!! Light: Provide bright, indirect light for plant growth and flowering to its fullest potential. Avoid direct sunlight as the heat can burn the foliage, especially in tender, young plants. Watering: Let the water reach room temperature before you water, it as this houseplant can be a little demanding in terms of its water requirements. Keep the soil moist at all times, however not soggy. If the leaves begin to fall off, it may not be receiving enough water. During winter months, you have cut back on the water as plants tend to rest due to the shorter light levels this time of year. Watering Tip: Plants in hanging baskets dry out faster and need to be watered more frequently. Temperature: Warm 70 to 75 degrees Fahrenheit, dipping into the 60 degree range at night, will keep your plant blooming and healthy. Humidity: You can increase the humidity levels by lightly spraying the leaves with a fine mist of water bottle several times as week. You may also want to consider getting a humidifier for the room. Fertilizing: Feed from spring to autumn with a houseplant food high in phosphorous diluted to 1/2 the recommended. Soil: Naturally, Aeschynanthus do not grow in soil, but a basic well-aerated soilless houseplant mix that drains quickly will work. A good potting mix should contain peat, perlite, vermiculite, orchid bark, and some horticultural charcoal to keep the mix fresh. Prunning: Cut above the leaf node where the leaf is attached to the stem. You can cut off up to 4 inches of the plant to stimulate branching and prevent it from looking leggy. In late summer after flowering begins to taper off, prune the plant back down to six of inches growth. Propagate: Plants are easily propagated using 4” stem tip cuttings from the newest vines in the spring. When to Repot: You can repot in the spring or summer when roots fill the pot. Be sure to move your plant up by only one pot size. Container: The pot size plays an important role in the plant's blooming times; for example, having the plant root bound will help the plant to bloom. If you want a larger plant with leaf growth instead of flowers, keep it in a larger pot. A lipstick plant will look fantastic in your home if it's flowing down from the ceiling, cascading around sides of a table, or flowing down from a wall sconce.